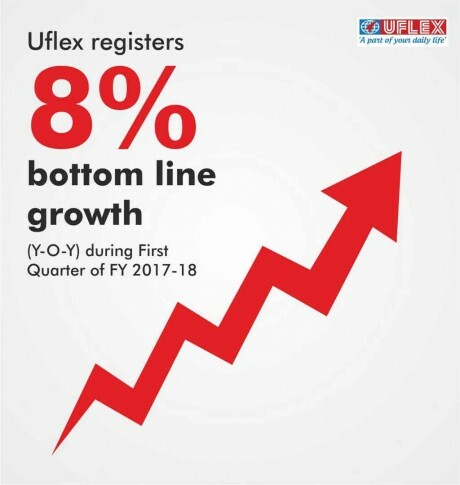 India’s largest multinational flexible packaging materials and Solution Company, Uflex Limited has clocked 8% bottom line growth (Y-O-Y) during the quarter ended 30th June 2017. Figuratively the Consolidated Net Profit stands at Rs. 93 Crore as compared to Rs. 86 Crore during the first quarter of FY 2016-17. At the operating level, Consolidated EBITDA rose by 4% to stand at Rs. 236 Crore as against Rs. 228 Crore during the same period in the previous fiscal. Consolidated Total Revenue for the first quarter of the current financial year is Rs. 1624 Crore as against Rs. 1516 Crore in the same quarter last financial year thereby registering a 7% top line growth (Y-O-Y).The total sales volume also grew by 5% as compared to the first quarter of FY 2016-17. Innovation to create value added differentiation is the cornerstone of Uflex Limited’s business strategy and the company keeps developing and launching newer films and packaging products that contribute to the overall financial growth of the organization. In an official document released soon after declaring the Q1 Earnings, Mr. Ashok Chaturvedi, Chairman & Managing Director, Uflex Limited said, “The Financial Year 2017-18 has started off on an assuring note! Our aseptic liquid packaging material manufacturing plant at Sanand, Gujarat has been commissioned. This has completed our product offering bouquet in its entirety. You will be glad to know that with this your company now stands in a good stead to offer end to end flexible packaging solutions for solids, non-aerated liquids, semisolids, viscous fluids, gels, pastes, granular material, powders among others. This feat will further strengthen your company’s competitive edge in the flexible packaging industry. On the innovation front, we launched several products in the quarter ended 30 June 2017 that continued to add value to the businesses of our esteemed clients globally.